Every so often, we like to introduce you to an artist who shows their work for display and sale at Inn on Mill Creek B&B. Barbara Brinson is one such artist, and we are particularly excited to gush about her because she is one of our awesome former guests! Barbara retired to the Asheville/Black Mountain area in 2015, after more than 40 years as a music teacher and choir director. We’re thrilled that she is now one of our neighbors! She has been passionate about stained glass since 2006, when she took a class in the art form. She began by making very original, abstract pieces as she honed her skills. She still does abstracts, and also enjoys using patterns to create boldly colorful pieces. In addition, she likes to incorporate many different textures of clear glass into creative designs. 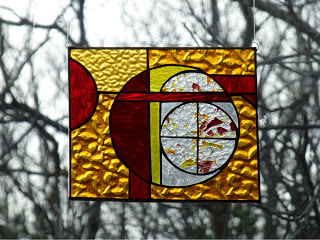 Barbara does larger pieces and has done several commissions, but the majority of her glass is in smaller sun catchers. Not only can you see her work at Inn on Mill Creek (and buy some to take home — locally-produced stained glass artwork makes a neat gift and souvenir), but you can find Barbara’s stained glass in galleries in Black Mountain and her work will also be at a new gift shop opening in Black Mountain called the Dancing Dragonfly. This entry was posted in Art and Artists and tagged local art by Inn on Mill Creek. Bookmark the permalink.